The government may have run out of money but the many friends of the San Bernard River saw to it that the FOR SB organization will be funding its programs for another year. A tip of the hat to all the participants, sponsors and volunteers who made it possible!!! 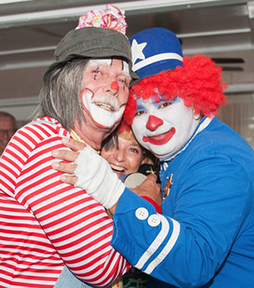 Thank you also to the Shrine Braz Clowns of the El Mina Shrine, in Galveston, Texas who were a part of this year's event and made it an especially fun time. Kudos to all the FOR Fundraiser Committee persons for their hundreds of volunteer hours spent making this year's annual FOR Fundraiser the "best ever". Also the FOR Decorating Committee just outdid themselves with the beautiful unique decorations. Everyone please take time to view the FOR Committees on this web site and thank them in person when you see them.